Yes, noted in blurb. I had spotted it there first and a quick price check flagged JL which was more accessible, for me at least. 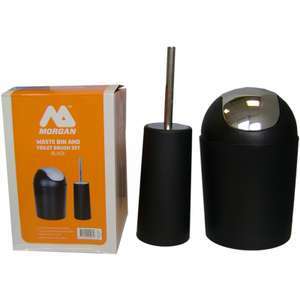 Bathroom Waste Bin and Toilet Brush Set - White A black plastic set including a 4.5L bathroom bin with a chrome lid and matching toilet brush with a stainless steel handle. 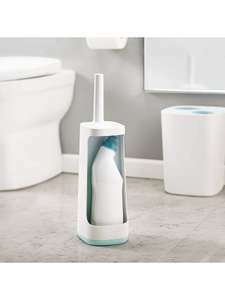 Keep your home essentials simple with this white, plastic toilet brush and holder. One brush, two jobs done! Bargain. I am going to pass on this one and get mine from John Lewis, as they offer a two year warranty! Been looking for a cheap scrubber. Trigger: And that’s what I’ve done. Maintained it for 20 years. This old brooms had 17 new heads and 14 new handles in its time. Sid: How the hell can it be the same bloody broom then? Trigger: Theres the picture. What more proof do you need? I don’t think they have an answer - as horrid as these things are - they are essential! Would be a rich person who could come up with a better solution! I still prefere toilet paper. Does this work with Poogle home? Currently have two of their bins, lid spring broke and motor replaced. Soap dispenser, chromed plastic coating came off. Shower dispenser, handle broke (replacement ismetal instead of plastic) Dish rack, rust (replaced 3 times). So, I just keep getting free replacements or parts from them under their 5 year warrenty. Appears as if this is more profitable for the company than making them properly in the first place. What's wrong with getting a load of bunched up toilet roll and cleaning the toilet bowel and under the rim and flushing it all before washing your hands thoroughly? 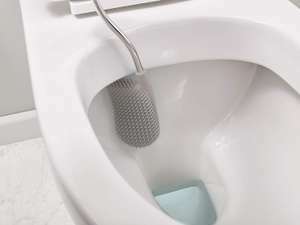 Never miss a 'Toilet Brush' deal again! Still available instore!! Shelf ticket said 50p for the black and the white but scanned at 1p! 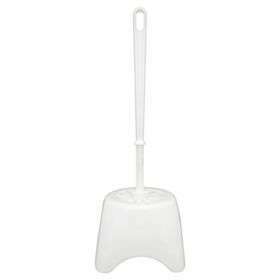 Dome white toilet brush, OOS online but my local store had loads in stock. Can also be used as tooth brush or mascara brush. Looks like they're going the way of Wickes and Currys ...repeat offenders with their inconsistent C+C service. Worked for me though. Honestly given the the technology we have nowadays how difficult can it be! Christmas present for missus sorted, thanks! GF Rotating car cleaning Brush. Most of store got stock. Also known as "The Paint Wrecker"
My wife with Coeliac disease will finally be able to clean the car. Thanks. Aye, I'll be scrubbing my front step with 1 of these. Simply Straight Gold ceramic brush by jml,in-store Haverfordwest..£2.50.worth checking your local.. They are good, but don't expect it to be as perfect as straightening irons. It certainly does a good job though. Does anybody have any firsthand experience using these types of brushes? How do they compare to traditional flat straighteners? Bought this. Thank you so much for posting - a real Hot Deal! Think this is the mini travel size, not a full size product? Seems like a great price. Thanks op. This is a great for swirl marks. Quick question I have a big car.How many times do I have to rotate it? Illamasqua final call reductions - Beyond Powder - Dynasty £23.80, free brush when you spend £60. This stuff is fab (y) &#x1F3FC; I use it and always get asked what make it is.